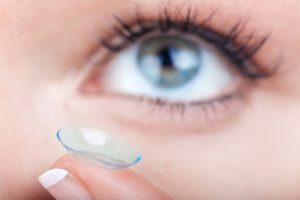 Can I Wear Contact Lenses After Refractive Surgery? The short answer to this question is “YES!” But, some of you may be thinking, “Why would I want to do that? I did the procedure to get out of contacts!” For those of you who have great vision at both distance and near after your procedure, the idea of wearing contact lenses post-surgery is completely foreign. But for anyone who did not have a successful procedure, had a complication after the procedure, or needs correction, at either distance or near, years after your initial surgery this may be a fleeting thought in your mind. Here are some facts: Radial Keratotomy (RK) was the most common refractive procedure in the 1980s. It quickly became obsolete partly due to the many complications which included prescription regression, fluctuating vision, and poor night vision. Laser-Assisted In Situ Keratomileusis (LASIK) and Photorefractive Keratectomy (PRK) are currently the most common refractive procedures being performed with LASIK being the most common by far. Although the majority of patients experience a successful procedure, somewhere between 5-10% of patients do not. Refractive surgery results in a cornea that is shaped like a bowl instead of like a hill. When the procedure goes according to plan, the patient will not need glasses for distance and possibly not even for near as well. BUT, if there is a complication or the procedure results in under-correction, the patient is left with an irregularly shaped eye AND blurry vision. In some cases, glasses are an option but not always especially for post-RK patients. So, where do we go from here? In my experience, most patients that return to contact lenses after refractive surgery do so simply because they have experienced a change in their distance prescription, or because they need reading correction over the age of 40. For the most part, if the patient is willing, soft lenses will do the trick. Because I co-manage many patients with local corneal specialists, I often care for patients whose corneas are so irregular that soft lenses will not work. This can be due to progressive flattening of their corneas, laser induced corneal irregularities, or scarring. In these cases, scleral lenses have been a true game changer! Scleral lenses, which are large diameter gas permeable lenses, provide regularity to an irregular cornea which in turn provides the clearest vision possible. In conclusion, if you were under the impression that contacts were not an option for you after refractive surgery, please let me encourage you to get evaluated. You could be missing out on clearer and more comfortable vision! Schedule your contact lens evaluation today.